A call to Greg Marino at Marine Industries in Fort Lauderdale brings confirmation that his joint listing with Jim McConville at Allied Marine, Westport's 34.13m motor yacht Andiamo has been sold and Greg mentions that Mike Levell at Atlantic Yacht & Ship brought the buyer to the transaction. 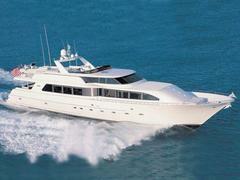 Andiamo is a Westport 112 built in 1999 and accommodates eight guests in a full beam master, VIP, double and twin. She was asking $3.995 million.